It has become an annual tradition here at St. John’s each November to celebrate the Feast of St. Andrew with a festal service of choral evensong. One of our most beloved annual musical traditions, St. Andrew’s Day Evensong shows our liturgy at its finest, with full choir, brass and bagpipe band. St. Andrew was one of the original Twelve Apostles and a brother of St. Peter. He is the patron saint of Greece as well as Scotland. In early Byzantine tradition he is known as “first called.” St. Andrew is reputed to have traveled with St. John the Evangelist to Ephesus and later preached in Scythia. He is said to have been crucified on an X-shaped Cross at Patras in Archaia, which gave rise to the Scottish flag consisting of a white diagonal cross on a blue background. 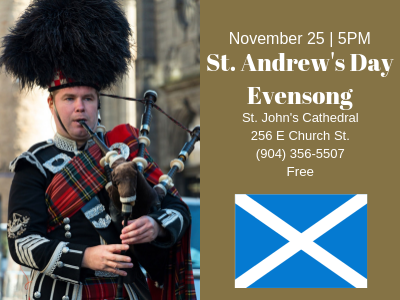 This year we will hold our St. Andrew’s Evensong service on Sunday, November 25th at 5:00 pm. All are welcome!